The radio is a constant hiss of static and occasional comments in Swahili and Steve, our driver, keeps it on but seems to ignore it as we bump along a dusty tire-track road. We stop for a herd of Cape buffalo and the five passengers in the van stand at once to shoot photos out the opened rooftop of our Toyota van. Suddenly Steve grabs the mouthpiece and replies, and without even telling us we are moving on, we are kicking up a dust trail. Maybe it’s from stacks of musty National Geographic magazines in my parents’ basement or just too many episodes of Wild Kingdom while I was growing up, but I have always wanted to go on a safari. I finally managed to make that happen with this trip I pieced together to Kenya for my wife Peung and me. We didn’t go package tour; we dug around in online forums looking for guide and company recommendations and booked each of four selected game reserves. Our goal was to go cheap on a couple safaris and splurge a bit on a third. Steve knows these endless crisscrossing dirt lanes spread throughout the 583 square miles of the Maasai Mara Game Reserve the way a seasoned taxi driver knows his town’s streets. The drivers have agreed-upon, unofficial names for even the most nondescript hills or turns and an honor system obliges them to report animal sightings to each other. Fail to do so and you’ll miss out on the next lion kill. The King of the Beasts is undeterred even by a circle of vans full of gawking tourists. Photo ©Preamtip Satasuk. “What is it, Steve?” I ask. The plural heightens our excitement at the news as we prepare cameras and search the terrain in front of us as if we could have any idea how to help him get there faster. About a mile later, we cross through a dry stream bed, rise up the opposite bank and lurch to a stop. In the shade of the bushes next to us are two lionesses, napping in the midday heat. The shutters are snapping and we the tourists are gasping along with them. Again Steve lurches into gear and I want to curse him because a guy needs about 150 photos of a lion, not just two or three. But before I can ask why, he rolls us around this shady bush and what we see is so amazing no one can articulate much more than some moans of awe. I’m counting. One gets up and moves across the scene. I see another camouflaged in the tall grasses, which are nearly the same color of their fur. There’s a very young one behind that other one. Counting the two we just saw — no wait, three over there — I can see… fourteen? A pride of fourteen lions. All of them sprawled in the grass like a house cat on a lazy summer day, licking paws, yawning, twitching flies from their faces. Three males are no more than 10 feet from us, barely paying any attention to the now four vans that are jockeying for position for best photo angle. In the days of film, this may have been the end of all the rolls. 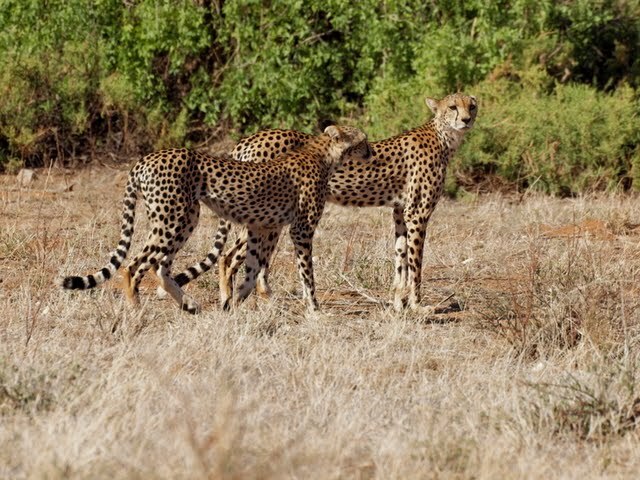 But the big cats, no matter how impressive, shouldn’t be the obsession on safari in Kenya. From a hilltop we look out over the dry sweeping plain of the Mara and in a patch of scattered trees my eyes tell my brain something is wrong with the picture. Closer examination sees about a dozen unusual trunks jutting up just above the tallest of the acacias: giraffes. They stand stock still staring up the hill back at us but then go back to raiding the foliage with their long, prehensile tongues. Elephants. We never get sick of seeing elephants. 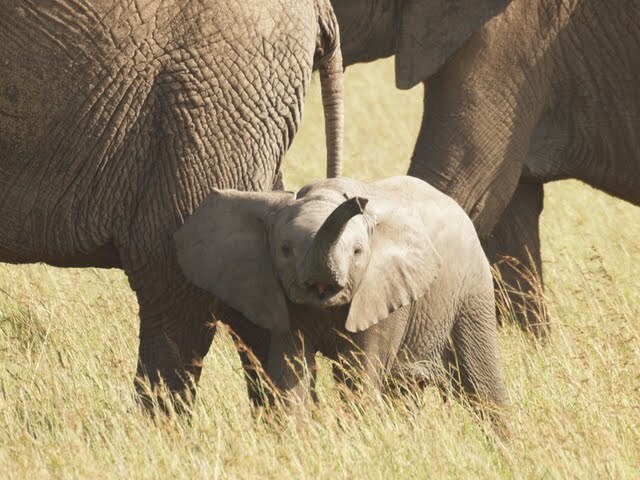 In March and April many have given birth and so weaving in and out of the legs of their mothers or running to keep up with the slowest walking adults are these absurdly cute creatures, waving their little trunks in the air as they learn how to control them. Our trip has taken us to four national game reserves in an attempt to get as much variety as we could in about 10 days. 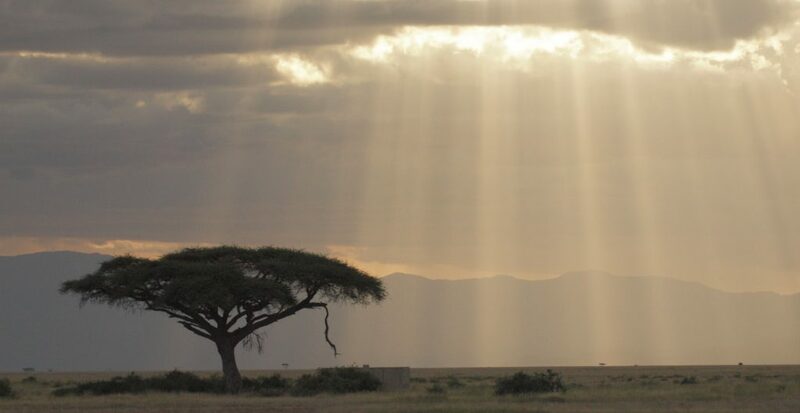 We started in Amboseli, the place to go if you want to see elephants. Large herds reside there and a photo of them in front of Mount Kilimanjaro just over the border to the south is an obvious shot. “Kili”, as some call it, overlooks all and from our tented camp we have a clear view from the bar as we gather for sundowners. Waters from its melting glaciers – perhaps melting too rapidly it seems – make their way down into Amboseli and create great marshy areas. 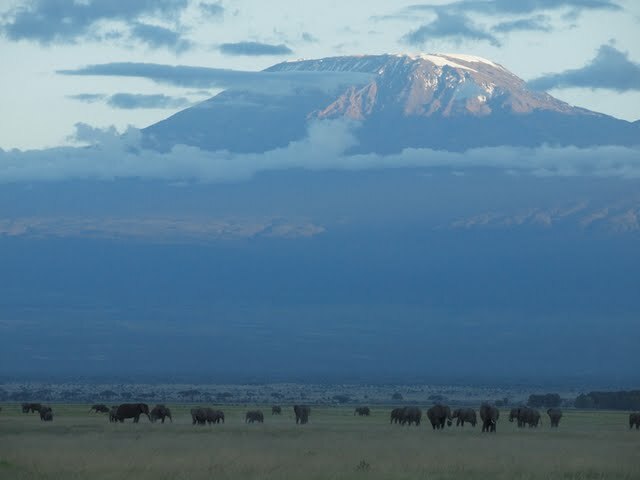 Large herds of elephants are dwarfed by Mount Kilimanjaro in the background in Ambroseli. In May, many of those are dried up but for a couple central wetlands areas where elephants and hippos nestle in up to their eyeballs. A small volcanic hill next to the marsh gives us a sweeping view of the park in all directions. Lake Nakuru is on the way to the Mara and we spend just an afternoon on a game drive there, checking the white rhinoceros off the to-see list but never finding the rarer (and grumpier) black rhino. The lake turns pink along the edges with massive flocks of flamingos and other long-legged birds. Baboons rule the parking lots where you stand straight as you walk through them so that there’s no mistake which branch of primates you belong to. Just a monkey? Well, no. This ape may frolic and toss garbage cans like the smaller primates, but has been known to take apart a leopard in a defensive rage. Let that little thought sink in and you don’t loiter in the parking lot. They climbed down off the van as Steve turned the engine over. We left the park as darkness fell and stayed the night nearby at a simple but clean hotel before continuing on to Maasai Mara on one of the wickedest bumpy roads you’ll encounter. 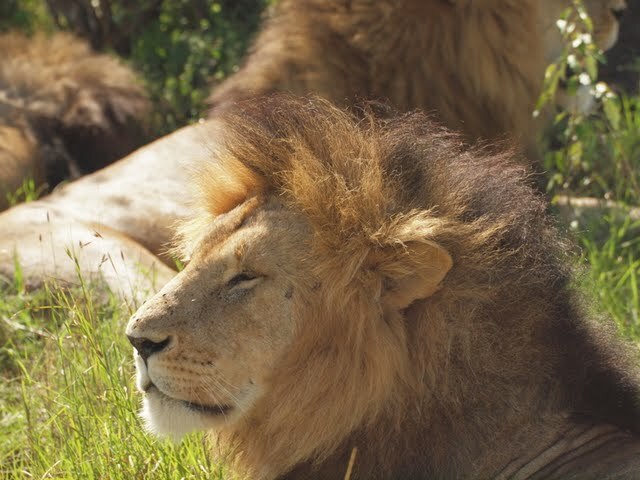 Maasai Mara included two full days of game drives. When we saw the large pride of lions, we figured that might be the highpoint. But the following day we found a leopard munching away on the kill it had dragged up into a tree. Big animals are great, but the subtle and sublime moments are no less memorable: seeing a sunbeam descending from the clouds out toward the far-reaching horizon, a flat-topped acacia, that iconic tree of Africa, standing in the brilliance like a spotlight offered for its appearance; watching a dung beetle, so frantic it makes an ant look like a loafer, as it rolls the unlikely sustenance for its next generation across the road; creeping up on gray-crowned cranes dancing for each other before the flock flight; finding a male hornbill digging into the dust for worms with his long beak and tossing them up in the air so he can get under them to get them down his throat. You can’t miss the thrill of watching an impala leaping high into the air, almost cartoonish as it covers far less linear ground than its long series of parabolic arc demonstrations. We stop over in Nairobi again, the center point for our excursions, and then head north to Samburu National Reserve where we check in at Larsens Tented Camp, a much more luxurious place than the basic camps we’ve stayed at thus far. Gourmet food, hardwood floors in tents with full-sized bathrooms and rain showerheads, coffee served on our stone porch just in time for the sunset over the river right out front. Hornbills chirp at me, monkeys envy the cookies next to the coffeepot, and I can almost make out what appears to be a crocodile in the shadow of the opposite bank. Our friend Charlie, Peung and I are the only guests in the 20-tent camp. On our first drive we find a leopard straddling a tree branch, just minutes from the front gate. We come very close to zebras and giraffes, different species from the Mara and Amboseli. 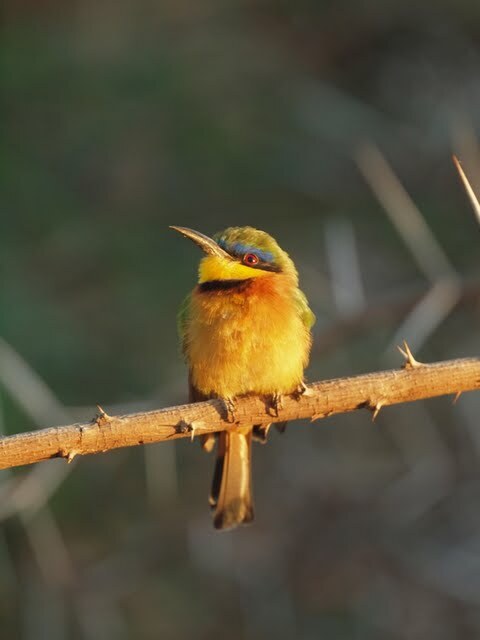 The bird population is rich and varied; we see an owl, several eagles, three species of hornbills. Because of the reddish mud, even the elephants seem different, and on one occasion we get a little too close for mutual comfort, a clear reminder that this is not at all just a big friendly zoo. We live to tell the tale and drive off in our vehicle, the angry trumpeting still ringing in our ears. Samburu is smaller than the other parks and closes in around us with its rocky hills and thicker brush. The river gives life to tall shade trees, and we sometimes don’t see animals until we are right on top of them, even Cape buffalos or giraffes. We have brought our own SUV to this park and so are free to do game drives without the guide as well. At night we dine on a deck next to the river, free from harassing monkeys who are down for the evening. Due to the calls of frogs and other creatures of the dark, I wouldn’t call this a quiet night by the fire. But none of it prevents us from falling asleep in the comforts of a big bed with a cool breeze of Africa inflating the tent walls a bit. On our last day, on the way out of Samburu, we stop when we see two safari vans together. This means “something to see.” And so it is, even at the last minute of our ten-day safari adventure, that we finally get to see cheetahs. A pair of females linger in a clearing, just several yards from our vehicle. We watch for nearly an hour before rolling up the windows and leaving Wild Kingdom behind for the highway back to Nairobi. 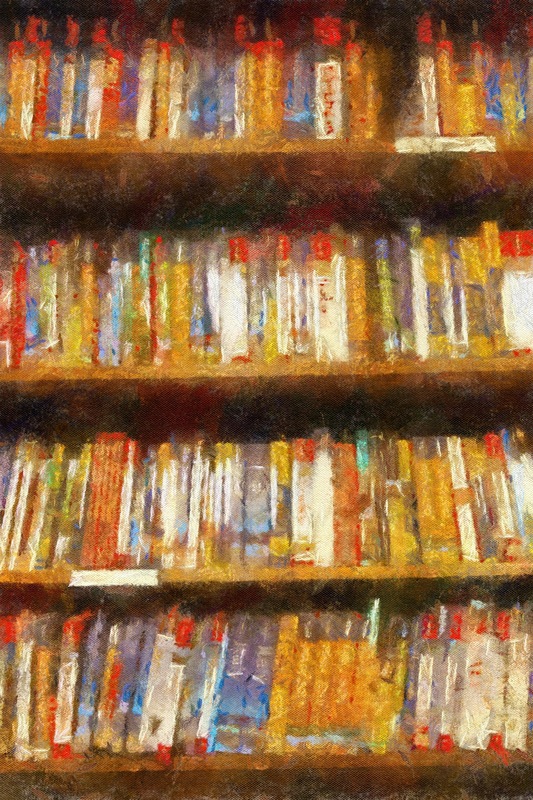 Story and photography by Kevin Revolinski except where noted.